Every couple of years, Amish Friendship Bread starters begin circling. And I am easily lured by the siren song of this delicious, cinnamony-sweet bread. That is, until the starters begin to multiply like bunnies in my kitchen, and I realize that I don't know enough people with a desire to bake to unload all of it! And after a few weeks, I decide that if I ever have to eat, much less bake, another loaf of friendship bread, I'll have to hurl. And if I ask one more friend to take a starter, I won't have any more friends. But, while it lasts - - - before the hurling and ruined friendships set it - - - it sure is fun! So, a little backstory here: I have a friend, Meghan. My sister, Karen, can claim her as a friend first, but I got to know her since I moved back to the area, and now she's my friend, too! 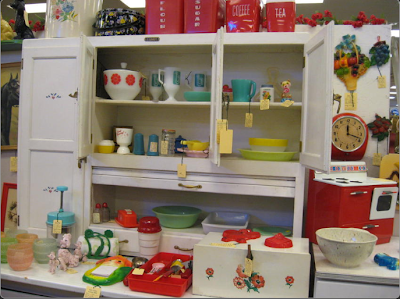 Ohio Valley Antique Mall - LOVE LOVE LOVE!!!!! She introduced me to the Mother Ship of antique stores, The Ohio Valley Antique Mall, and took me there and shopped with me all afternoon, and encouraged my trivial purchases but discouraged the extravagant ones. She made me brownies. 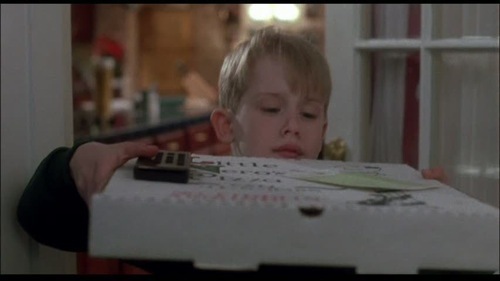 Do you remember in Home Alone when Kevin says, "A delicious cheese pizza, just for me."? That's how I felt when Meghan gave me a pan of delicious brownies, just for me. And now she's MOVING AWAY!!!!!!! BLERG!!!!!! She arrived on my doorstep on Friday with a box full of miracles and wonderment! This simple cardboard box was a veritable treasure trove containing A SERGER, some pins, a pair of fancy paper scissors and a sparkly headband. All amazing, for sure. I won't lie, I have no idea how to serge. I've never touched one in my life. In fact, taking these photos constitutes the closest I've ever been to one. But I'm gonna' learn! I will! Am I wrong to be nervous by all of the thread? Thank you, Meghan, for my brand-spankin' new-to-me serger! I promise to think of you every time I break a thread! It’s easy to date a girl who reads. 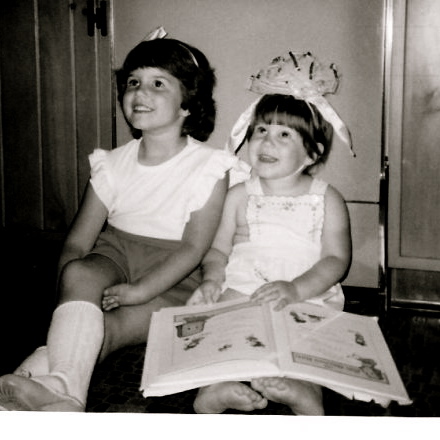 Give her books for her birthday, for Christmas, and for anniversaries. Give her the gift of words, in poetry, in song. Give her Neruda, Pound, Sexton, Cummings. Let her know that you understand that words are love. Understand that she knows the difference between books and reality but by God, she’s going to try to make her life a little like her favorite book. It will never be your fault if she does. You get to use up your scraps. You can try new techniques on something that doesn't take months and months. You can try new quilting patterns. And . . . they're frequently USEFUL! Useful things are the best, particularly useful things that you can use on a day-to-day basis. Case in point: The Mug Rug. I have to tell you, when I first heard about mug rugs, I was skeptical. Something about the name was too sweet for me, and I couldn't get my head wrapped about why you would want a place mat just for your mug. I get it now. I have fully and completely embraced the joy of, not only making, but also using a mug rug. We swapped mug rugs at a meeting of the Cincinnati Modern Quilt Guild months and months ago, but I just came across the pictures and thought I'd share what I made and received. For the swap, we each paired up with a partner the month before the swap took place, and gave them our favorite mug for inspiration. I brought in one of my orange Fire King mugs—LOVE (you can see it on the far left below). The mug rug that I received in the swap was made by my friend, Amy, and it has been on my bedside table for my evening cup of coffee ever since. I made this one—a mini Dresden plate appliquéd onto a polka dot background. I used a lot of topstitching around the plate center to add some stitching detail, and I pieced the binding from some of my scraps—it was completely unintentional, but the way the binding fell around the edge made it look striped which was cool. It's kind of hard to see in the photo, but I shadow-quilted around the plate, repeating the ripples all the way to the edges of the rug. I've discovered that in your late twenties and early thirties, EVERYONE HAS BABIES! This is a wonderful thing, because who doesn't love babies? The result, however, of your best friends having babies year round is that we quilters make baby quilts year round. They're fast and offer immediate quilty gratification. It's wonderful to make something that you know will be loved and very well used. 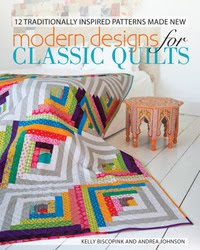 They offer a great excuse to try out new patterns, fabrics, and quilt designs. Handmade gifts really show that you care! In this specific case, I care a lot! Jess has been one of my best friends for almost 10 years now—as I type it, I can't really believe it's been that long! Jess and her husband have a beautiful family, and have a brand new little member due any day now. Because of my extensive traveling in my previous career, I haven't been around for the births of her previous children; I really wanted to try to make up for lost time with this new baby. And I absolutely had to make this new baby boy a quilt. This quilt couldn't be any simpler—it's fast, it's sturdy, you can use up your big scraps, and it's easy to adapt for a girl version. I absolutely love how it turned out! Finished size: 36.5" x 36.5"
Backing fabric: approximately 41" x 41"
1. With a pencil, draw a diagonal line on the wrong side of each gray square. Place each gray square right sides together with a print square. Sew 1/4" seam on either side of the drawn line. Cut along the drawn line to create two half square triangles. Press both halves open. Repeat to make 64 half square triangles. 2. Arrange the half square triangles in the desired configuration of 8 rows of 8 blocks in each. There are a ton of different ways you can arrange your blocks, so have fun! I suggest taking a digital photo of each arrangement. Quickly flipping through photos makes it easier to choose a configuration, and if you want to re-create a previous configuration, you have a photo to help you arrange it again. 3. Begin sewing your half square triangles together in 2 x 2 blocks. Carefully line up all of the diagonal seams by peeking into the seam allowance. Pin pin pin! And make sure you are sewing an exact 1/4" seam; a larger seam will cut off the point of your triangles. 4. Sew the blocks together into rows, and sew the rows together to complete the quilt top. 7. ....and then wrap the binding around to the front so the folded edge of the binding just overlaps the stitched line. Sew along the folded edge, attaching the binding to the front. This method of binding is a little sturdier than hand stitching it, which I think is important for a quilt that will get a lot of love and washing! And there you have it! Finished baby boy quilt! The same quilt would be extremely easy for a baby girl: use a white background with pastel colors in the same layout and Voila! Hope you enjoyed, and happy stitching! Ok, so let's be honest. Mail is awesome. Parcels and boxes are better. When the parcels contain fabric, it's the best of all. Gleeful, even. Jump-up-and-down inducing! When I opened my mailbox this afternoon and discovered my Spoonflower order had arrived, I actually squeaked a little. Honestly, I giggled, squeaked, ran inside my apartment, and threw my bills in a heap on the counter, all in my excitement to tear open a package that I ordered myself. That's the funny thing about fabric—it's like ordering yourself a present! Now, I should get massive credit for containing my Christmas morning instincts and not ripping this envelope open as I ran up the stairs. Or sitting on the curb and tearing it open in the street. No, I waited until I could get my camera and take pictures of this magical moment to share with you. And then I ripped it open. I've been wanting this particular print for ages now, and next months' swap through the Cincinnati Modern Quilt Guild gave me the perfect excuse to order it. Next month, we're swapping Spoonflower charm squares, and this print will be my contribution. I can't wait to see what everyone else picked out!!! I have to say, I'm extremely impressed with the personal touches from my order. The fabric was wrapped in tissue paper, and I received a Spoonflower label. And, most importantly, the fabric is beautiful and just what I was hoping for! Packages are awesome, fabric is great, Spoonflower is fantastic, and I am one happy little sewer!